The sun was still 20 min from peeking over the ridge... the ES-II with Elite Chrome loaded was acting temperamental, it was 24 degrees F.... Lukcily I had a proper camera with me, the Bessa 66 with its uncoated Skopar. 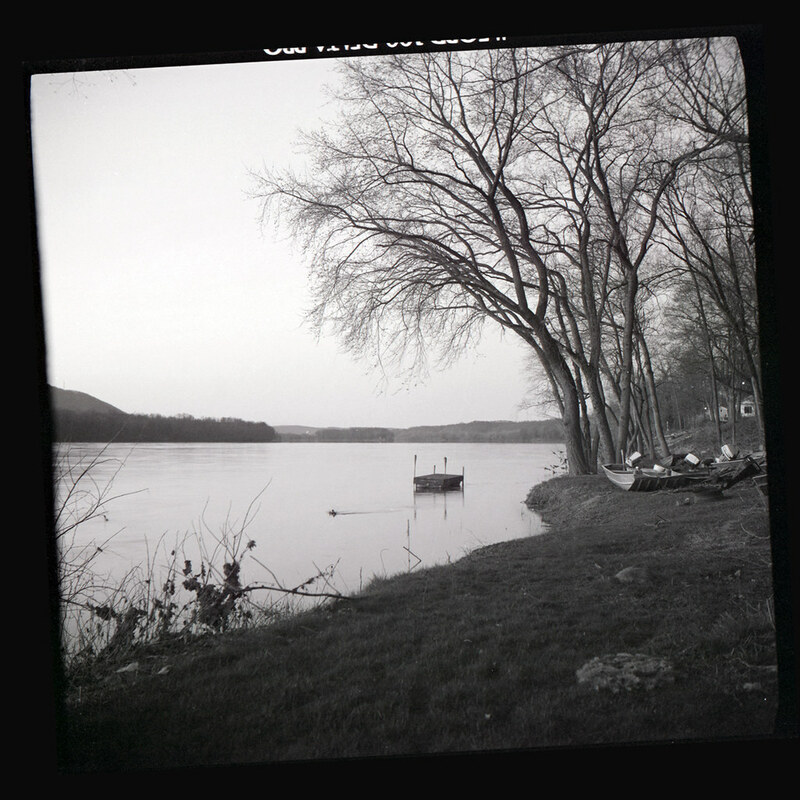 Ilford Delta 100 in Fomadon Excel (Xtol) straight, 8 minutes, film #9 for the liter. Epson 4490, slight curves adjustment + .2x150% sharpening. Nice mood in the picture. Fine gray tones. But the boat is ugly. using it for a kite. It was an interesting setup, there's a street that runs along the river, with houses on the other side. The actual river bank seems to be an extension of their front yards, and there are many boats like this one. If I recall correctly, this is at f/5.6 or f/8 and 1 second, on a tripod. beautiful. 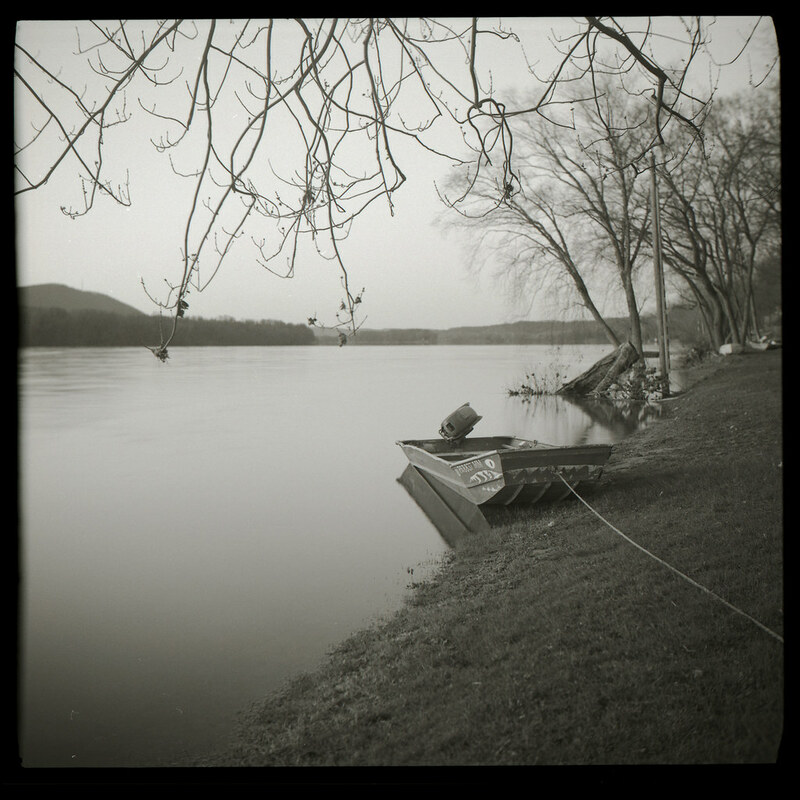 how far is the susquehanna from your home? thanks for the ID... it's about 3 hours to where I was. I love this...the boat but especially the trees behind the boat. thanks, I like those trees in the back too. I like the tone of the second pic much better, Jussi. When I saw the first one my first thought was it needed more contrast. Then I realised it is in RGB format and when I converted to greyscale it matches the second one. Do you prefer B&W pics in RGB? Sorry to hear your ES-II is giving problems. That's a shame, I've been very pleased with mine. What's the problem? The ES-II developed an intermittent electrical system; it hasn't given me this problem before - and I had Eric Henderson put in a new circuit last year. But a lot of it has to do with operator error, perhaps, and I intend to check out the battery compartment cover. I was going to blame the cold morning, but during the day the camera kept its temperamental behavior. Perhaps also the batteries aren't the best, I'll have to order a new batch. I like the boat. Even closer would suit me as the details (war paint) look interesting. That Delta is awesome stuff. Sometimes is hard to compose at square. But I like both. And that boat isn't ugly. She's only feeling blue.